Let us now praise tiny things. Graduation weekend is upon us here in Gambier, and so my thoughts have turned in yet another way to beginnings, to the great pleasures of nurture that works, to the joys of small things' growing. 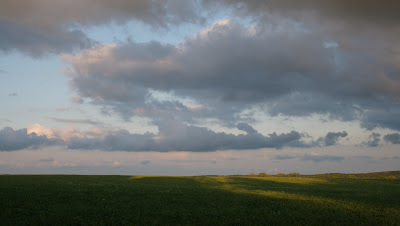 Coming home from a reception, I started chasing a lovely view through the backroads near the village. I wanted the biggest sky possible for you, wanted to get the most variegated clouds in all their harmless drama. 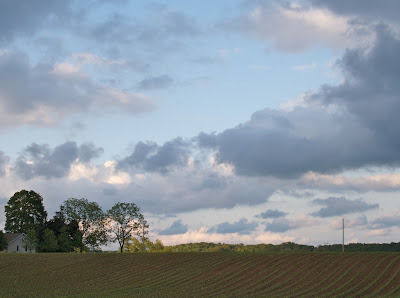 By the time I reached vistas, though, I was distracted by new plants: the corn started shooting up this week, curving and cutting green rows through our fields. But suddenly there were cows. And not just cows, but also frolicsome calves. 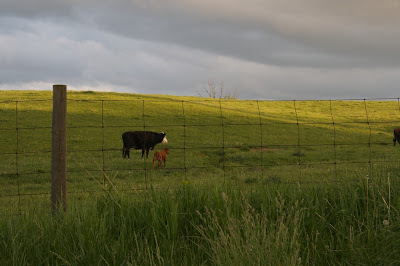 And who can think about lenses when one is watching calves scamper and lope? And double back to pounce and ram each other in their play? 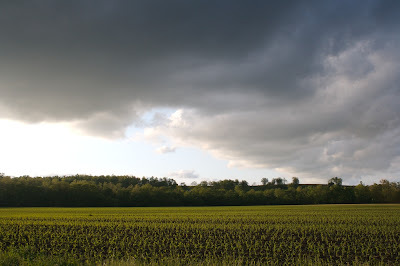 In the north of England one summer, I lived for two weeks at a university that bordered a farm. 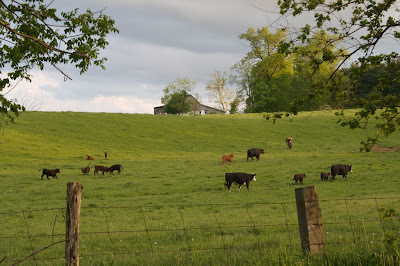 In the evenings, I would walk out across the university grounds and stand by the fence between the cricket lawn and the pasture where cows and sheep grazed together. On my penultimate night at the university, I wandered down to the fence without my camera. All the cows were far away in the field, feeding. One looked up and saw me standing by the fence, and soon they were all wandering my way. 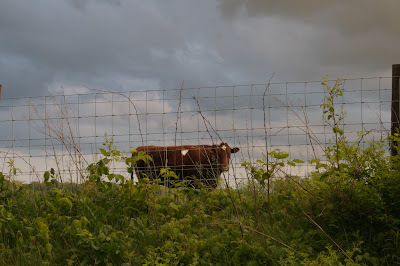 They jostled each other for position on the other side of the fence, one by one, until twenty-eight were facing me, pushing each other, sometimes trying to step up over one another, all staring with their great fluid eyes. There were no sounds but the hard grind of their teeth and their fast, steaming snorts. I could barely tear myself away. I could barely keep from reaching out to stroke their noses. They shifted and stared, pushed at one another without taking their eyes at me. They lined up one nose after another, two eyes at a time, stamped the ground. We all stared for a long, long time before I could pull myself away. 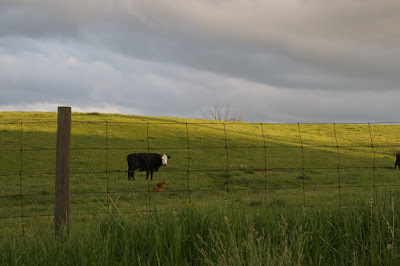 Days earlier, a cow had played a game with me for half an hour, approaching when I turned my back, then scampering away as soon as I turned toward her and took even two steps her way with my camera. I would turn and pretend to be watching birds; turning around again, I'd find her ten feet nearer to me than she'd been when last I looked. At one of these turns, I managed to photograph her breaking into a gallop away from me. I hadn't known full-grown cows could move so lightly. 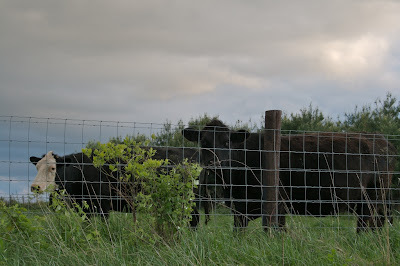 Tonight, the cows I could not see mooed and mooed, while the cows staring at me just stared. What I love about watching cows before they figure out I'm watching--cows in their off-hours, as it were--is the way they tend to one another. They are not delicate animals, in either their movements or their affections. Nor are they harsh. They're just direct: they will nose one another in the flanks, hit heads about the ears, push each other where and when pushing is required. They are solidly companionable, and that is its own great grace.